The importance of consumer touchpoints to brands and retailers is rapidly growing given the complexity of the customer journey, which is increasingly becoming omni-channel (Verhoef et al. 2015; Payne et al. 2017). Despite the increasing importance of touchpoints, the issue of whether specific customer segments encounter and prefer specific touchpoints is still unexplored (Lemon and Verhoef 2016). This is relevant as brands and retailers are called to define touchpoint journeys that matter. Brands and retailers are challenged to (re)design touchpoints for delivering a seamless customer experience to heterogeneous and dynamic segments of consumers in an omni-channel context (Homburg et al. 2017). 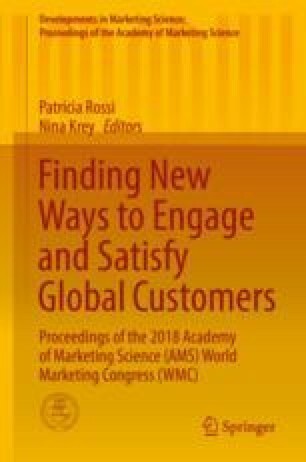 With the aim to understand customers’ attitudes and behaviors, many marketing researchers use generational cohort segmentation (Bolton et al. 2013). Generational segments show similar behavioral characteristics that are a function of their similar formative experiences, technologies, and reactions to cultural and environmental changes (Soares et al. 2017). Academics and practitioners have focused on generational differences in terms of human values, attitudes, and behavior. However, no study has addressed how generations differ in how they encounter touchpoints. For instance, millennials may prefer electronic connections, whereas for other generations, personal contact (salespeople, customer service, and call centers) may remain crucial elements of the journey (Lemon and Verhoef 2016). Moreover, boundaries across generational segments are not well-defined. Academics and practitioners largely use generational cohorts that have been identified in the US context only. Even within the US generational segmentation, no consensus can be found in the literature over the time span of each generational cohort. The present study, deployed in two different countries, Italy and Japan, aims to understand how generations differ in encountering touchpoints in a retail setting and to provide an empirical generational segmentation based on touchpoint exposure across generations in two different countries. As far as the Italian sample (as the analysis on the Japanese sample is still in progress), the study was able to find new cutoffs for the various cohorts. Moreover, a significant difference has been detected across generational cohorts in the frequency of touchpoint exposure in grocery retailing. Results suggest two issues for discussion: generalization of the generational differences across countries and design of customer journeys based on different generational cohorts.